Providing audio connectivity to users of NEC’s SoftPhones. 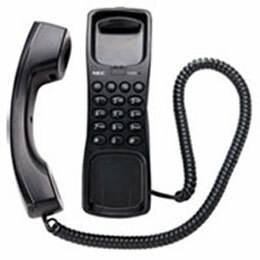 NEC’s USB Handset (UTR-1W-1) plugs directly into a USB port on any desktop computer or laptop and lets users perform the same functions as they do on a standard IP desktop phone. On/Off hook detection by cradle Available. Note 1: Headset is not available in VPCC environment. Note 3: Only narrowband voice quality is supported for VPCC environment. Note 5: Only narrowband voice quality is supported for VPCC environment. Note 6: Headset is not available in VPCC environment. Headset is connectable with Dterm Sp30 (Version P/Version 17 or later or SP350.